November just got better with our low rates! Low rates = more savings = more for you to spend on activities for the holiday! 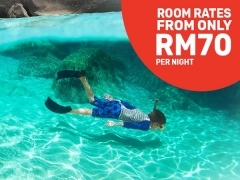 Book your stay across Malaysia today! This promotion is valid from 1 – 30 November 2018 or until all promotional rooms are sold out, whichever is earlier. The promotional rate only applies to Double Rooms. The discount will only apply for stay dates 1 day or more from the date of booking. All rates quoted are inclusive 6% SST. Check out Tune Hotels for more details about this offer and to book your accommodation now!